Starbucks Via Pumpkin Spice instant coffee, prepared as directed. When Starbucks first released Via, their instant coffee product, I tried the free samples offered by staffers at the store, who foolishly dared customers to tell the difference between a freshly brewed coffee and a cup of instant. While Via was easily the best instant coffee I’ve tasted to date, even four-year-old me could have picked out the real from the instant. So, why even bother? The vast taste difference between instant and even the most basic brewed coffee more than justifies the minimal effort required to brew a pot at home. Are people really too lazy to scoop some coffee from a can into a filter, add water to a machine and flip a switch? In any event, the single factor that convinced me to pick up a package of Via instant coffee at my local Starbucks last week was the promise of being able to quickly and easily make a Starbucks-grade Pumpkin Spice Latte at home, by way of their new Pumpkin Spice Via flavour. If such a product was decent, the shelf-life meant I could potentially be drinking my beloved PSLs into the new year, well after they’re off the Starbucks menu for another year. Inconceivable! The Look: Much like the other Via packages, which means it gets lost in all the Via boxes by the front counter. Each box contains five pre-measured foil-plastic pouches of coffee/sugar/spice. After mixing with hot milk, the resulting beverage is a brownish tan colour. The Method: I used 2% milk that I heated in the microwave, then followed the directions: pour the powder into a cup, add 240 mL of hot milk, then stir. The Taste: Right from the start, something isn’t quite right. Instead of pumpkin spice, the aroma that wafts up from the cup is artificial vanilla of the Maxwell House International Cafe variety. The flavour is also off, with bitterness and a dusty chemical flavour instead of the more subtle mix used in store. These flavours get more nasty as the drink cools down. The pumpkin level in the Via version is higher than in the store-made drink, and the cup I mixed at home (per Starbucks’ directions) was stronger than the PSL I bought at Starbucks an hour earlier (you know, for the sake of accurate comparison and all). Overall, it tastes like a spicier variant of the instant Irish Crème coffee that sat for years in my childhood kitchen pantry. Ugh. 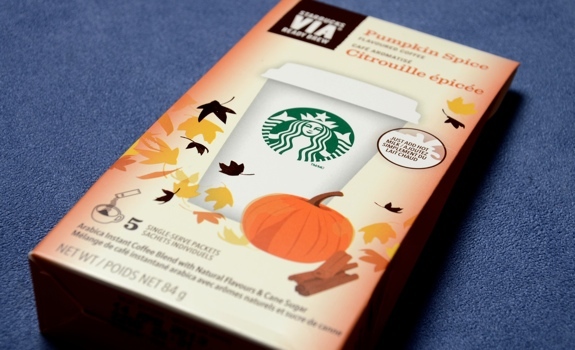 Starbucks Via Pumpkin Spice instant coffee, in its standard Via-style boxed packaging. Cost: $7.95 for a five-pouch pack at my local Starbucks in Calgary. Value for cash money: Kind of dodgy. Cost per packet is $1.59. Add to that the price of 240 mL of milk, the recommended quantity to use with one packet. 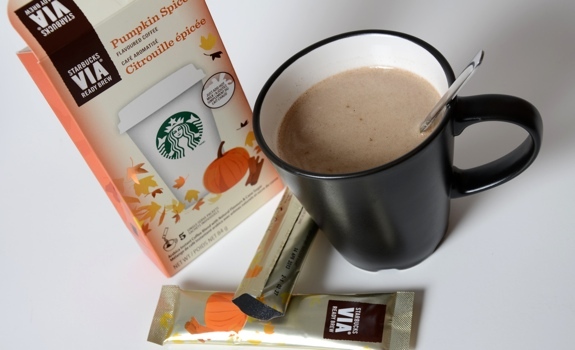 Since 240 mL is roughly 8 oz, half the size of a grande (16 oz) at Starbucks, you’ll need two packets and 480 mL of milk to make a similarly large PSL at home. If you bought a 2 litre carton of milk at Safeway for $3.29, you’ll need $0.79 of milk to make a grande PSL. Add those pieces together, and you’re paying $3.97 ($1.59 + $1.59 + $0.79) for a grande PSL made at home, compared to the $4.85 you’d pay for a barista to make one at a shop in Calgary. And there’s no whipped cream on the one you make at home. Availability: Canada, certainly, and probably elsewhere. I assume this is a limited edition thing. Nutrition? : Per 1 packet (17 grams), not including milk: 60 calories, 0 grams of fat, 1 mg of sodium, 0 grams of fibre, 1 gram of protein. The verdict: Not even close to the same as the drink made in store. The value is also a sticking point, especially since the quality isn’t up to snuff.